Manufacturer & Supplier of Solar Fencing. Our product range also comprises of Solar Water Heaters, Solar Power Plants and Solar Equipment. 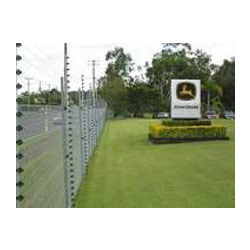 Being a significant name, we are engaged in manufacturing and supplying Solar Fencing. These frameworks are utilized broadly as one of the best options of the routine kind of boundary protection. Clients can source these items with the certification of easy to use operations and to pander to their broadened assurance needs from interlopers and creatures at habitations, foundations, stadiums, horticultural grounds, woodland terrains and different spots. We also render installation services for these products. The system will alert any kind of intrusion through an audio alarm System. The security fence system will produce a high voltage at an energy output of 3 Joules, which will act as an active deterrent, a physical barrier and a reliable detection system. The Energizer will be able to check the fence around 50 times a minute and the instant the pulsated wires are cut or tampered, a built-in-alarm will immediately alert the monitoring personnel and the security authorities, along with the zone of attempted break-in (Optional) External Alarm will be activated within a second. The Lead Acid Battery (Reputed Make) along with electronic system will be concealed in a Metal box. Looking for Solar Fencing ?